Awwwww. . .I wanted this one to show up in the top 3 :( It is most deserving to be there! Nice finish, but by far deserved top 5. Sweet, good detail, especially on Whiskers whiskers! I like the soft colors. What a shot! Love the focus on that cute face. Totally purrfect in every way!...Came back to add - this is my favorite shot of the challenge. My guess is the blue! Ohmygoodness. She is so cute! Photographed beautifully! A flawless 10 from me! I think that this is a superb image relative to lighting, composition, DOF, and degree of difficulty. Best of luck, however it wouldn't surprise me if you got spanked for the lack of WOW appeal. Absolutely adorable baby face with perfect detail. Those little whiskers are fabulous :-) I like the angle of the shot, too. I'm not crazy about easy to be cute kitten shots, but the level of detail here is amazing. That is SOOO cute!!! Great Focus. I feel as if the cardboard was more of a tool used for an animal portrait; rather than creatively used to create a shot. I'm not going to give you a DNMC as you obviously put thought into this and there is a box. Things seem a little too dark. Great cat shot. 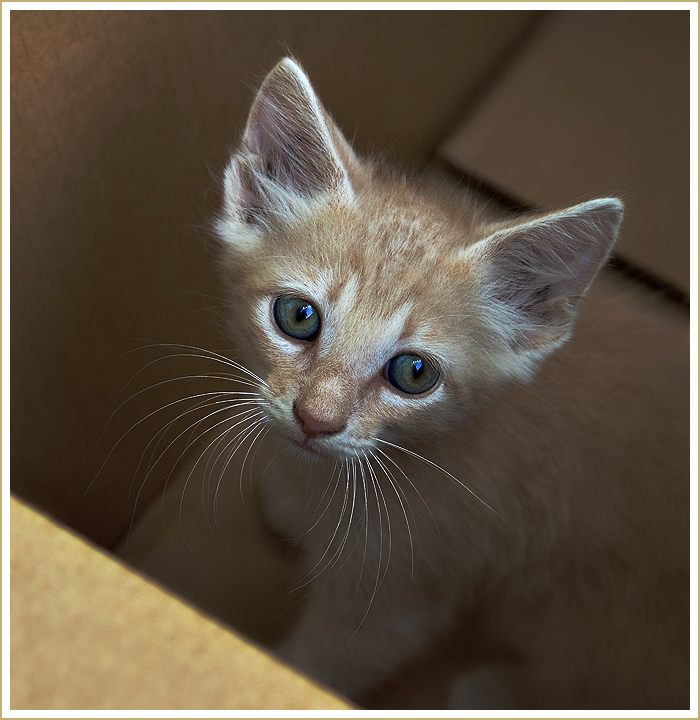 For this challenge, though, would have been nice for the box to be the subject, rather than the kitten. Seems a bit oversharpened, but still very adorable! The box is sort of an afterthought here isn't it? Clever way to get past the dumb challenge idea, so kudos to you. Awwww!!! I want another cat, but my wife is allergic to them. Proudly hosted by Sargasso Networks. Current Server Time: 04/18/2019 09:03:15 AM EDT.